Lubliniec pronounced [luˈblʲiɲet͡s] (German: Lublinitz) is a town in southern Poland with 29,359 inhabitants (2004). 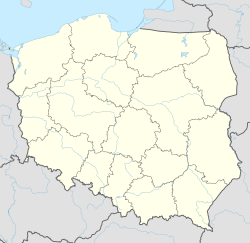 It is the capital of Lubliniec County, part of Silesian Voivodeship (since 1999); previously it was in Częstochowa Voivodeship (1975–1998). Lubliniec is situated in the north of the historic Upper Silesia region at the rim of the Upper Silesian Industrial Region, about 60 km (37 mi) northwest of Katowice. It is an important rail hub, with two major lines crossing there—east-west (from Częstochowa to Opole) and south-north (from Katowice to Poznań)—and a site of light and chemical industry. The surrounding area is characterized by extended forests (Lasy Lublinieckie), including the Upper Liswarta Forests Landscape Park north of the town. Lubliniec was established about 1270 by the Piast duke Władysław of Opole on the road leading from his residence Opole to Kraków. By the turn of the 13th to the 14th century it had obtained the status of a town according to Magdeburg Law by Władysław's son and successor Duke Bolko I. He had been one of the first Silesian dukes to become a Bohemian vassal in 1289. Duke Jan II the Good granted the citizens many privileges, including brewing and market rights as well as the permit to form guilds. Upon Jan's death in 1532, Lubliniec with the Duchy of Opole fell as a reverted fief to the Lands of the Bohemian Crown, which since 1526 were ruled by the Austrian House of Habsburg. It became part of the Habsburg Monarchy until it was annexed with most of Silesia by the Prussian king Frederick the Great in 1742. The first railway reached it by 1884. The former castle of Lubliniec was converted into a hospital for the poor in 1893, then altered to a psychiatric hospital in 1895/96. After World War I, the region was divided according to the Upper Silesia plebiscite in 1921, whereby 88% of the Lublinitz citizens voted for continuance in the German Weimar Republic. Nevertheless, after Wojciech Korfanty had initiated the Third Silesian Uprising from the nearby village of Czarny Las, it was incorporated into the Silesian Voivodeship of the Second Polish Republic and became a border town. Again occupied in the 1939 Invasion of Poland by Nazi Germany during World War II (and renamed Loben, 1941-45), the area was re-conquered by the Red Army in January 1945 in the course of the Vistula–Oder Offensive. Lublinitz is the birthplace of the mathematician Richard Courant (1888–1972). His cousin Edith Stein often visited the house of her maternal grandparents Courant near the rynek, today the site of a small museum. Major General Roman Polko (born 1962 in Tychy), served in the Polish 1st Special Commando Regiment at Lubliniec. Wikimedia Commons has media related to Lubliniec. This page was last edited on 13 March 2019, at 00:37 (UTC).